Should You Buy Micromax A116 Canvas HD? – Compared With Galaxy Grand! While most of the smartphone users in India are rejoicing Micromax’s upcoming handset A116 Canvas HD’s release on 14th February 2013, that is Valentine Day, I diving in to the details to find out whether you should buy A116 or not. Should You Buy Micromax A116 Canvas HD? As you might have seen Samsung made exactly similar handset Galaxy Grand recently that has been actually offered by Micromax named A110 Canvas, It was a smart move to offer something much better for comparatively smaller price change. Micromax A116 sounds like a huge deal of you compare it with Samsung Galaxy Grand now, but all of this fight is still on paper, as we have to yet test out how the A116 actually works in real world. If you go bragging about features & specifications of A116 only, then it is really a solid deal for you. And if you go on build quality, most important feature of any smartphone that is touchscreen quality, and processor itself, any regular smartphone user will tell you to wait a little. So in this decision-making dilemma, I am quite sure about my opinion – Buy it! And don’t worry, I am not leaving you just yet, I have clear justification why you should buy it, and what your expectations from it. So here are the reasons why you should buy A116 Canvas HD & quick comparison with galaxy Grand Duos. 1. HD screen smartphone at lowest cost! Micromax A116 offers 5-inch 1280×720 pixels of IPS display with capacitive touch, which no other smartphone offers under Rs. 25,000 price point. So this is first big thing you should consider if you are planning to buy this phone. 1280×720 is basically a 720P HD display, that have millions of pixels in it and will ensure the highest quality of photo & video viewing experience you can get. Also the Android 4.0 will surely look colorful and vibrant on such high-definition display, which kind of makes it interesting. It’s so much better than a next big branded offering of Samsung Galaxy Grand’s WVGA, 480 x 800 Pixels Display. You can argue with me on this point, of it’s still on paper, and we haven’t got hands on it yet, but guys look at the specs first. A whole new generation of 1,2 GHz Quad-Core CPU named MediaTek MT6589, is their first unique processor offering in Indian market after the NVIDIAs well-known Tegra 3 chip. And this quad-core handset in combination with PowerVR Series5XT GPU & 1GB of RAM will ensure the best performance for high-end gaming, watching high-definition videos & for an ultimate browsing experience. As this processor comes cheaper, Micromax can offer the whole package in budget cost. But don’t expect anything similar performance compared to Tegra 3! 3. Android Jellybean At Cheapest Cost! Again, being a budget-friendly device, one more goodie you get with Micromax’s A110 Canvas HD is its high-end operating system. This phone will be the first smartphone to offer Android 4.1 under Rs.15,000 Rs of price tag. As this phone will come already bundles with Android 4.1, you can expect few next updates of Android as well. Jellybean is well-known as fastest Android yet & comes with project butter, that ensures most fluid touchscreen experience as well! 4. Hats off to A110’s Pricing! 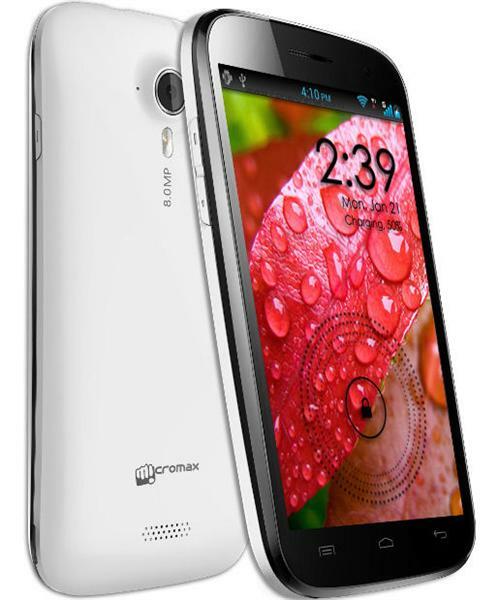 And also but not the least, the pricing of Micromax A110 Canvas HD is only Rs. 15000 in India, which makes it a big must-have for any new smartphone user, and even considering as a great phablet companion for regular smartphone users as well. On the other hand Galaxy Grand DUOS comes at approximately Rs.22000 and much less features. VGA front camera & only 4GB internal memory & hopefully the average build quality will be some of its downsides of Micromax A116 HD, compared to Samsung Galaxy Grand, but remember you are paying much lesser for comparatively better specification device! And Galaxy Grand has better offerings here like 2MP front camera, 8GB internal memory & much better build quality. This was my reasoning based on the hands on experience with Micromax’s previous big devices and Samsungs as well, though I am very interested in knowing what you think about this beast device in comments section below. And if you like this article, do consider sharing it on Facebook & Twitter! The New Kindle Lineup: Which Is Best for You?